Magnus Öström was born in 1965 in Skultuna just outside of Västerås.. He started his drumming career at the age of nine in the cellar at home where he built a drum set made of his father’s empty paint cans. When he turned eleven he got his first real drum set and took it across the street to a then-aspiring piano player who had just got together his first chord. That neighbour was Esbjörn Svensson. They started out on a trial and error period that many years later resulted in the now world famous e.s.t. It is actually not easy to write a musical biography of Magnus without mentioning Esbjörn, because their musical development is so intertwined with each other, especially in the early years. They went on playing together in different bands with various musical styles for over seven years and also studied at the local upper secondary school of music before they departed from Västerås in different directions for higher studies in music. Magnus studied music at a college in Dalecarlia for a couple of years before he began his studies at the Royal College of Music in Stockholm. Though Magnus nowadays is mainly known for his work with e.s.t. he has done a whole lot of other things. Since moving to Stockholm in 1985 he has played with Swedish musicians and artists varying from Jokkmokks-Jocke and Bertil Boo to Nicolai Dunger, Moneybrother and The Plan. In a way you can say he has done it all. But if you look through his CV there is of course an overweight of Jazz. 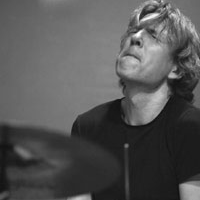 Nisse Sandström, Peter Gullin, Anders Widmark, Monica Borrfors, Jan Levander, Svante Thuresson, Jeanette Lindström, Bobo Stenson, Lina Nyberg, Nils Landgren, Putte Wickman, Steve Dobrogosz, Victoria Tolstoy and the band Jazz Furniture are only some of the names with whom he has played. He has also performed together with international jazz stars such as Pat Metheny, Benny Golson, Curtis Fuller, Buster Williams, Mulgrew Miller, Roy Hargrove, Conrad Herwig and Stefon Harris. Today Magnus is mainly concentrating on touring and recording with e.s.t. but from time to time he does recording sessions with other artists in his hometown Stockholm.